Do you enjoy the varied extreme metal sounds of CEPHALIC CARNAGE, DESPISED ICON, and ABORTED? Have you ever yearned for a group that blended all three into one album? Then have I got a band for you! 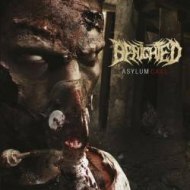 On "Asylum Cave", France's BENIGHTED mix and match with pizzazz and forsake neither melody nor their own technical bent toward death metal. BENIGHTED have done a smashing job of shrapnel-blasting, grooving, and breaking down the structure at just the right moment while telling the tale of a schizophrenic man that takes his twisted, obsessed cues from one Josef Fritzl. Not familiar with the name? He's the Austrian nut job that was arrested in 2008 for holding his own daughter Elisabeth captive in a hidden basement area of his house and "fathered" seven children with her. Yeah, the subject matter of "Asylum Cave" is not of the Disney channel variety. Neither is the shape shifting, technically spattered, and grind-infused death metal that comes with slamming grooves and an unhinged ferocity that almost never lets up. And when it does cool out a bit it is only to reveal a somehow fitting moment of relative calm during the atmospheric, darkly melodic moments heard on "Hostile". When BENIGHTED fire up the grinder it's like NASUM on crack and when they groove it out it is pure, head-banging bliss, as heard on tracks like "Prey", "Fitzl", and the album's strongest cut, the equally diverse and memorable "Let the Blood Spill Between My Broken Teeth". The upshot is that neck snapping moments are nearly as frequent as the memorable ones, particularly during the first half of the disc. Did I hear some SLIPKNOT-ish, turntable scratching effects on "Drowning"? I believe I did and that's no reason to enjoy "Asylum Cave" any less. Yep, it works, almost as well as the strategic vocal shifts from growl to shriek to pig squeal. Guest vocals are brought to your by our friends in DEVOURMENT and ABORTED. It all benefits the greater BENIGHTED good. "Asylum Cave" is a face breaker, a machine gunner, and a memorable shape-shifter. A special edition of the album designed specifically for the French punters features exclusive artwork and a bonus cover of NASUM's "Wrath". How much gory fun can you stand anyway?